This workout is from the 2011 December issue of Men’s Fitness. What caught attention about this workout were some of the similar exercises that I have reviewed in other workouts. Due to my hectic schedule I have as of late, I’ve been looking for routines that deliver on intensity and doesn’t take too much time. Maintaining all the work of have put in the last two years to loose 40 lbs and keep it off isn’t just a goal it is a obsession. 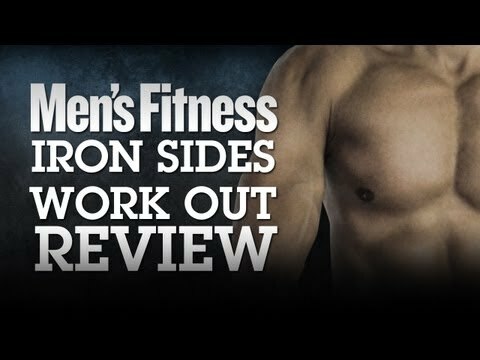 Iron Sides is a efficient, full body, core blasting and fat burning workout that is easy to remember and do. Here are some ways that I use it to increase difficulty and burn a little extra fat. Make it harder – Shorten the rest period between exercise to 20s, 15s, 10s, or 0. I personally only rest at the end of the circuit. 2. After workout burner, after a workout perform two circuits to burn extra fat. 3. Vary weights to increase intensity, for example the clean press start with a 45 lb kettlebell and switch it to a 30 for circuits 3-5. Here are some reference links I used to create this video. Note I boiled down the exercises to give a general guideline on how to do the exercise. My video is only 5 mins. In total the reference links below are about 20 minutes worth of video. Steve Cotter Kettlebell – Steve is the the man!incredible Kettlebell videos. where they are mega popular you can actually become a certified Kettlebell trainer. 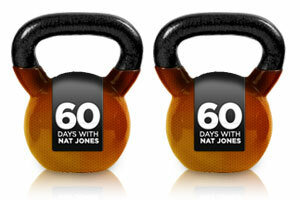 I recently purchased two 30lb Kettlebells to add another layer to my fitness routine. They say your supposed to acclimate your body to Kettlebells. I just went to Sports Authority lifted a few and went with the weight that had a moderate resistance. For as much as I have been lifting, my tolerance is getting higher and I can handle more weight. However the kettlebells due to there odd shape just feels different when you workout with them. Unlike traditional dumbbells, the Kettlebell’s center of mass is extended beyond the hand, similar to a Clubbell’s. This allows for swing movements not possible with traditional dumbbells. More muscle groups are utilized in the swinging movement of a Kettlebells than lifting of dumbbells, it is said to be more effective, and yields better results in less time. My wrist are taking a bit of a beating and my hands are getting more callous due to the twisting motion from the grip. My tolerance for the pain only goes so far, a pair of lifting gloves with wrist support alliviated the issue. The workouts I have been doing are from my FitnessBuilder app. FitnessBuilder was the first fitness product that I started the whole 60days with. I still use this app on a regular basis. I am able to program all workouts that I review and talk about into it so I can keep track of everything that I am doing. FitnessBuilder is the most sophisitcated fitness app in the market, a personal trainer in your pocket. When you work out with Kettlebells make sure you have enough room. Your going to do a lot of swinging motions. So clear out your workout space, make sure your kids if you have any and pets are out of the way. Swinging around any amount of weight is going to cause some serious bone crushing damage if you hit someone or something by accident. For form get a mirror. For exercises there are a ton of really good references online. 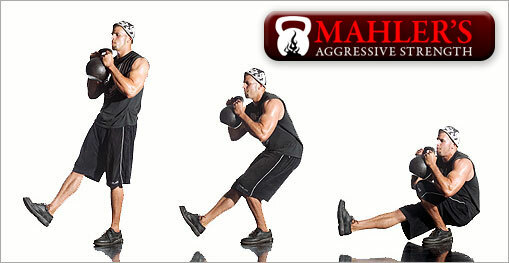 One guy who is just ripping it up with Kettlebells, is Mike Mahler. He has workshops, training videos, and e-books. Click here to check out his site with example kettbell exercises. Below is one of the exercises you will find on his site. Kettlebell Pistol (One-legged Squat) Holy leg strength Mike! So how do I feel so far from training, I am totally sore. Kettbells are a full body workout with a ton of core movements. I feel like I have been washed and rinsed. My core is screaming at me and when I wake up I am still feeling it, from the workout I did yesterday. So far I think the kettle bells are worth it.